OK, the topic is types of beetles, and for many people, it’sa real yawner because, well beetles are not as popular an insect for the general population, as say butterflies. Luckily, insect enthusiasts often think beetle identification, if only because of their potential threat to lawns and gardens. That’s a good thing. With names such as Dung Beetles, June Beetles, May Beetles and Rhinocerous Beetles, the native Scarab Beetles are often colorful and easy to identify. 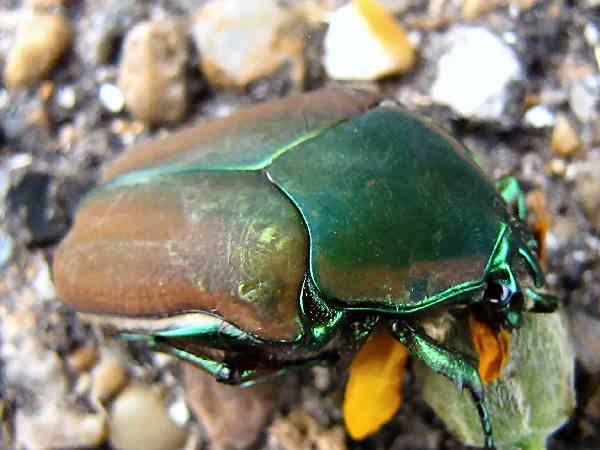 The picture shows a large green June Beetle in the Cotinis genus. A type of beetle commonly found in residential areas across the United States. Suborder Adephaga: While often characterized as the large ground and water beetles, not all large beetles found on the ground or in the water belong to families in the suborder. Suborder members are held together by a handful of shared physical characteristics. Suborder Polyphaga: This is the largest group, with estimates that it contains close to 85% – 90% of all beetle species. Ladybugs or ladybird beetles might be the most easy to identify beetle group, however identifying lady bird beetle species may not be so easy. Identifying flower beetles such as the longhorn beetles, common visitors to residential areas, starts by noticing their long antennae. Carrion Beetles are a great story that comes from the suborder Polyphaga. Their salvaging habits make them one of nature’s natural recyclers. As far as beetles go, it’s a small family. Depending on the source anywhere from thirty to fifty species can be found in the United States. The common name carrion refers to the fact that the beetles feed on a variety of invertebrate animals from birds, to rodents to snakes. Adults lay their eggs in the bodies, and through a remarkable engineering effort, they (adults) bury the bodies in the ground, thereby providing food and shelter for their larvae. Many species also grow over one inch in length, and their wandering along the ground makes for easy pickings for insect collectors. 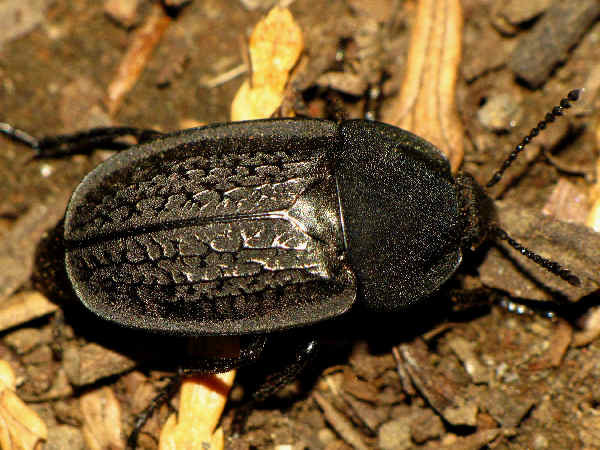 Logic suggests that identifying ground beetles begins by establishing the fact that the beetle in question actually is on the ground, rather than, for example, being on a tree. It’s a good ID starting point. 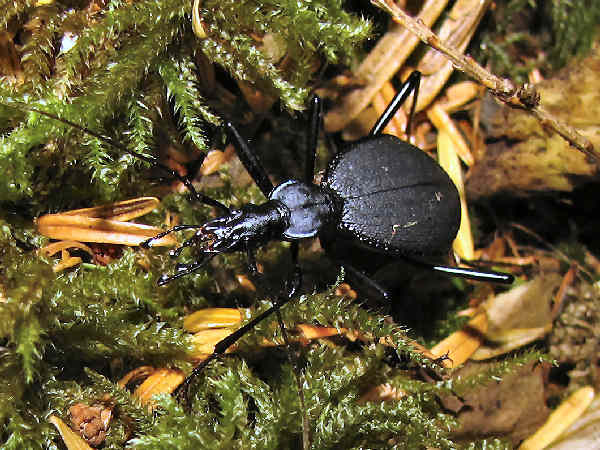 Moving past the basics, identifying ground beetles often begins with a walk through the woods, or along a river path. The large, dark bodied beetles, forest floor predators go by the name ground beetles, a large family (Carabidae) of beetles in the suborder Adephaga. Ground beetles inhabit most areas of the world, and scientists estimate up to three hundred thousand species have already been documented. They spend their nights, (most are nocturnal) roaming the ground in search of insect prey. The narrow head and jaws make it easier for it to feed on snails, it’s meal of choice as it roams the forest floors. Some ground beetles can also be identified by color. North America hosts approximately one dozen different Pasimachus species, often called Blue-lined or Purple-line Ground Beetles because of the colorful tint around the edges of the body. The picture highlights the Pasimachus large head and jaws. They are predators that use their jaws to catch and consume caterpillars and a variety of insects in their territory. Pterostichus, a dominant genera of Woodland Ground Beetles can often be identified by a shiny body and striated elytra. On occasion, ground beetles are known to make their way inside structures. 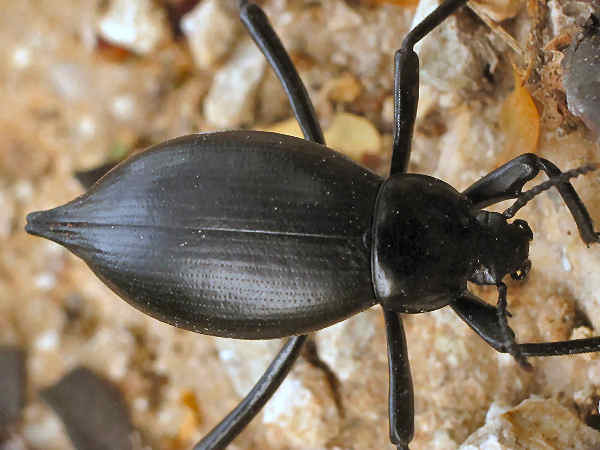 While known for powerful jaws, most ground beetles are not known to actively bite humans. All things being equal, they prefer a flight over fight defensive strategy. Most will scurry away from humans, and on occasion they will fly. Because they are beneficial insects, agriculturalists generally do not recommend the use of pesticides as a pest control strategy. 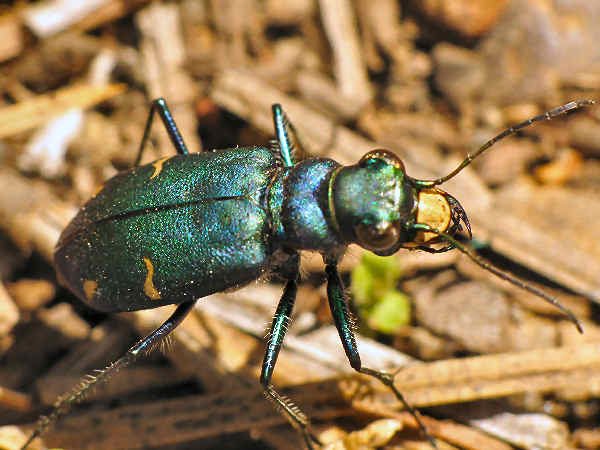 The name tiger beetle generally refers to members of the Genus Cicindela in the ground beetle family (Carabidae). Close to one hundred different species live in the United States. Many entomologists consider them beneficial insects because they prey on pest insects such as flies. 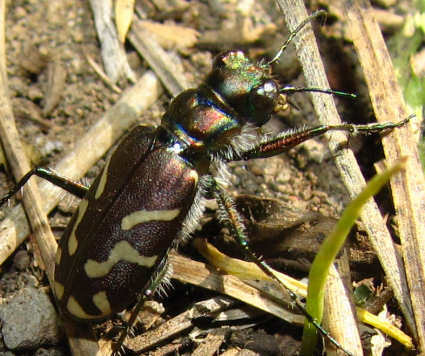 Most tiger beetles can be found in areas of sandy soil along water ways. Identifying them starts by noticing their movement. They tend to scurry along the ground at a fast clip, looking for food. The top picture shows a colorful species measuring about one-half inch in length. It also shows the insect’s jaws, that might inflict a painful bite on any person who picked it up. Picture two of the Olique-lined tiger beetle, highlights the light line pattern on an otherwise dull, brown body. There is also a subspecies with a green body. 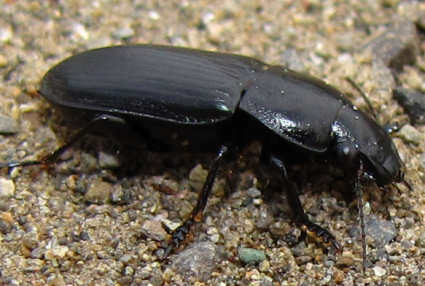 Because both live on the ground, Darkling Beetles (Family Tenebrionidae), often get lumped into the ground beetles group. With well over one thousand Darkling Beetle species (Family Tenebrionidae) in the United States, identifying any species can be difficult. 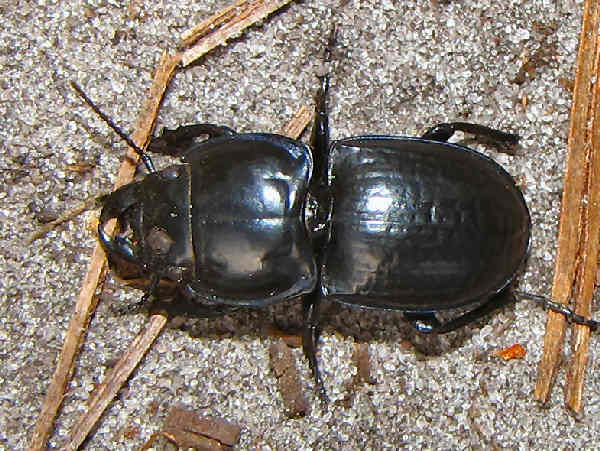 Generally the family gets its name based on the beetle’s dark black or brown wings. The wings are fused, making them ground bound, a perfect environment for their food, dead or dying plant material. They are medium sized beetles, with a few species measuring up to two inches. Larger ones, like the species in the top picture look similar to ground beetles. Often the shape of the antennae and legs are used to distinguish between darkling and ground beetles, see the ground beetle picture for a comparison. Darkling larvae, mealworms, can be agriculture pests because they feed on grains. The top picture shows a specimen from the coelcnemis genus. 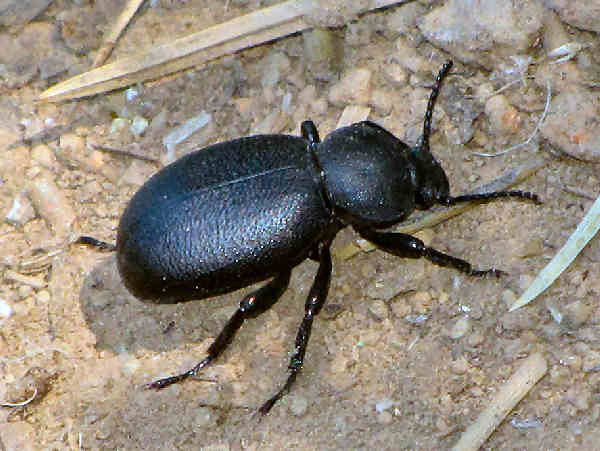 The second picture, a tailed beetle, shows a specimen from the Eleodes genus, more commonly referred to as desert stink beetles. Another interesting example from the suborder Polyphaga, Bess Beetles (family Passalidae), are represented in the United States by four different species. Primarily a tropical family, they are known mostly for their large size, (one and one-half inch body length). Additionally, they are considered social insects that live and breed in downed trees. 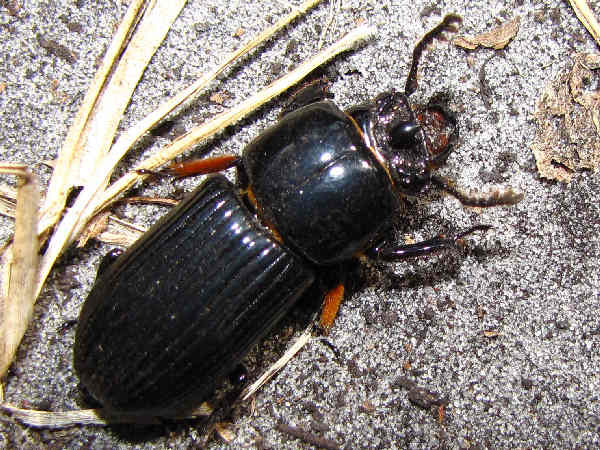 The picture shows Odontotaenius disjunctus, complete with its shiny black body, horn and brown legs. It is the most common species, found in forest and woodland areas throughout much of the eastern half of the United States.